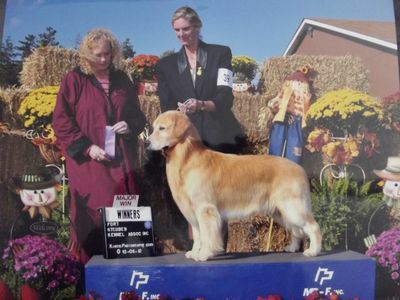 We have been breeding and raising goldens in our Kentucky home for over 30 years while showing in conformation, agility and obedience. 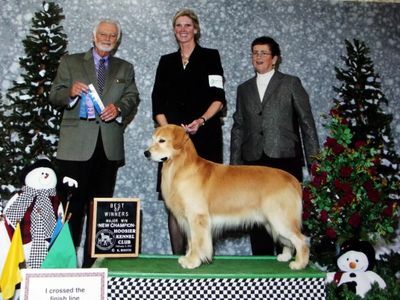 The show quality goldens we breed all have four genetic clearances (hips, elbows, hearts and eyes). Puppies are placed in loving pet family homes. 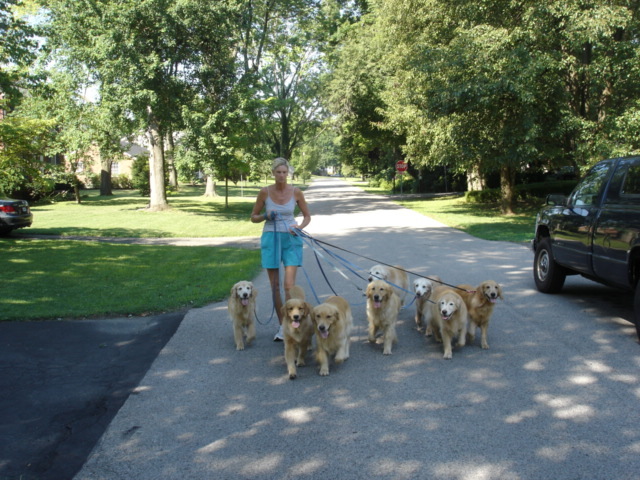 All seven live with me in my home and are a huge part of my every day life whether it’s running around the acreage, running around a show ring or running through an agility course. 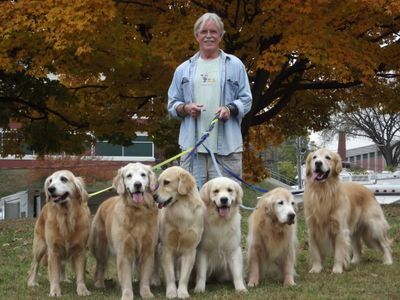 We call them the velcro dogs… because they always want to be with you. I can’t imagine life any other way. I’m sorry I have not been better at keeping this site up to date with more pictures, but the past two years was fighting a daily battle with Bobby’s two forms of stage four cancer. It was the greatest challenge of both of our lives and we fought really hard through so much chemo and all that goes up and down with cancer. Bobby lost his battle and I lost my husband of 30 years on September 20, 2016. The last six months took ever ounce of my soul trying to be a good caregiver, and the last 21 days where …well there just are no words. So please bare with me as I try to find my life again. I can tell you that my dogs have been my salvation through all of this. They have given me purpose and filled a very sad heart with love. I would not be here without them. 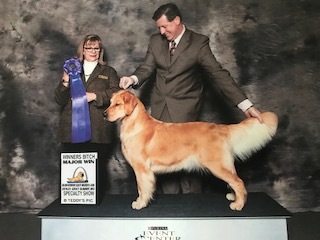 January 2018, first time ever I have sent one of my girls (Gabi) out with professional handlers to enjoy the show ring. 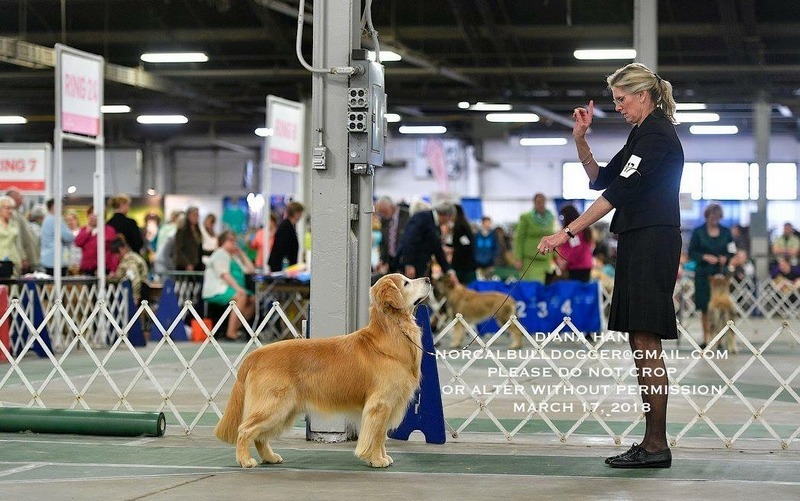 With it just being me now, I knew I would not have the many opportunities I would need to get this girl’s championship. 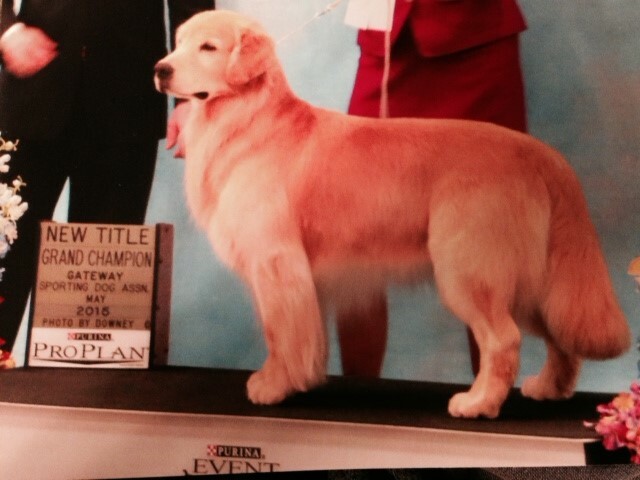 I was fortunate to get her first two points and put an International Champion title on her. Well, I have not been let down. I knew she was ready and within just a couple weeks she had her first MAJOR win. 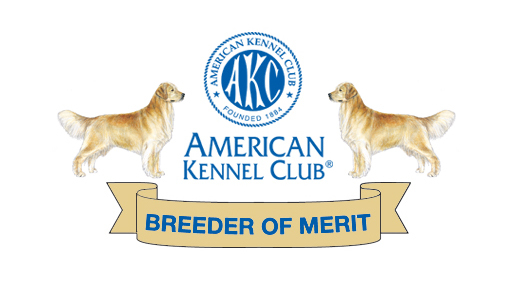 By February, she had two more MAJOR wins and to date is only one point away from her AKC Championship. I’m not sure I could be any prouder. 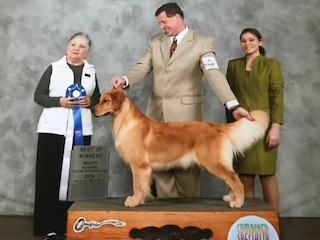 UPDATE on GABI —- As of March 24, 2018, she is now known as American and International Champion Kattwalk’s Breaking Newz @ Goldenstar….. She also has 20 Grand Champion points to date!!!!! 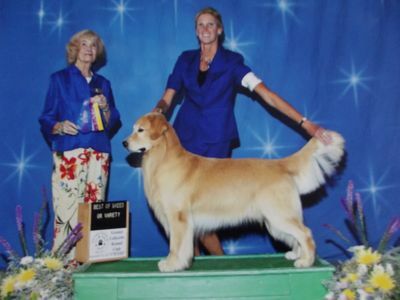 As of May, 2015, Toby is our first Grand Champion and International Champion totally owner-handled!!!! Enjoy our site and our pictures. 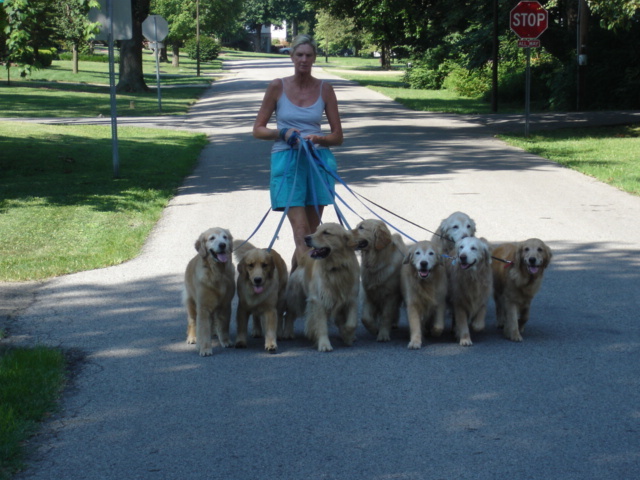 Allie, Lexi, Toby, Molly, Katie,Teddy, Jody and Lucy out walking with Mom. 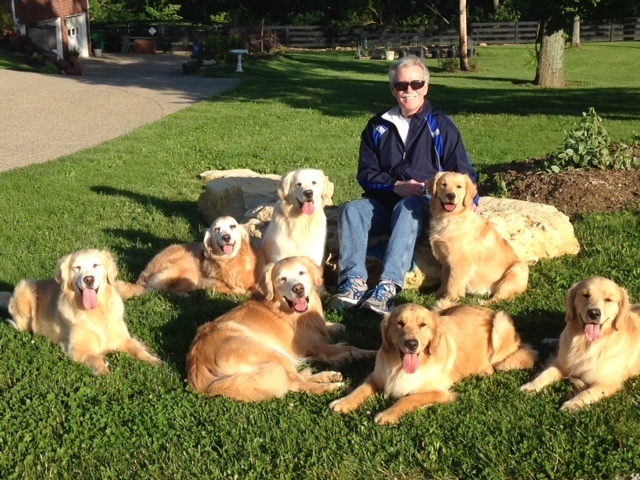 Me with all of Allie’s last litter…a golden blanket! I am one proud Mom!!!! 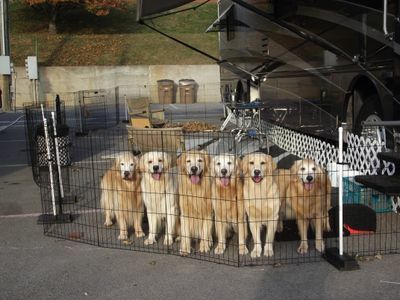 November, 2013, Knoxville, TN – All six enjoying their travel time and walks. Road trip!!!!! 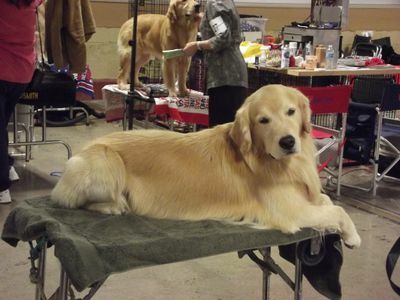 Toby Chillin’ on the table before taking Best of Breed and a group 3!! !